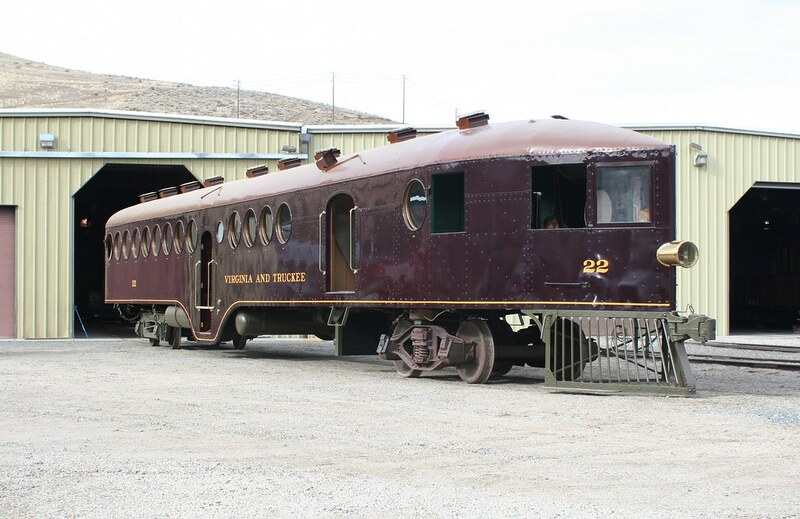 The McKeen Motor Car, which has been under renovation at the Nevada State Railroad Museum for the last 14 years, is finally finished and ready to be publicly unveiled. This isn’t the first time it’s been out in the sunlight; they’ve taken it out a few times before, and I even had the perfect timing last year to be able to see it when it was out. But last year only the exterior was finished; the engine or power train hadn’t been installed yet. Now it’s all done, save a few finishing touches, and a date has been set for it to make its first public appearance. May 9th, 2010, is the 100th anniversary of when the McKeen car first arrived in Carson City to run on the V&T Railroad. And that is the date the ceremony will be held to celebrate the completion of the renovation. A big gala will be held at Wabuska Station at the Railroad Museum, and a limited number of tickets will be sold to ride the car at $10 per adult. For anyone who’s been watching this renovation project, this is an exciting day. I’ll be sure to be there on May 9th, which is also Mother’s Day, to see the McKeen Car finally come out of its hiding hole. More info is at the NSRM Friends site.